This is a lovely dish for an Easter meal or Sunday dinner. Make it into a festive occasion with assorted appetizers, salads, and sides, or just serve it with a salad and cheese for a simpler meal. To increase quantities, figure 1 pound of uncooked meat per person for boneless roasts, 1 1/2 to 2 pounds per person for bone-in roasts. The best way to test roasts for doneness is with a meat thermometer. Cooking times are approximate. Rinse the meat with cold water and pat dry. Mix a little salt and pepper in a small bowl. Make small cuts into the meat at various points. Coat the garlic in salt and pepper and insert into the cuts. Using your hands, coat the meat first with lemon juice, then olive oil. Season with salt and pepper and place in a roasting pan. 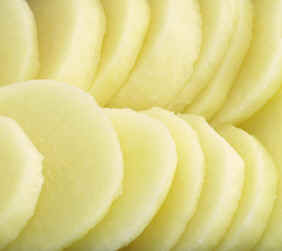 Peel and clean the potatoes and cut into rounds or slices, lengthwise. Salt and place around the lamb. Pour the remaining olive oil and lemon juice over the potatoes, and sprinkle with oregano. Pour 1/2 cup of water into the bottom of the pan (down the side so it doesn’t coat the potatoes or meat). Roast at 350F (175C) for 1 hour (about 25 minutes per pound for medium/medium-rare doneness), checking every so often to make sure there’s still a little water in the bottom of the pan. If the meat starts getting too brown, cover with foil. Test for doneness. 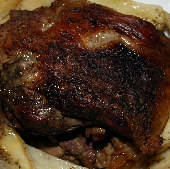 Cooking time: Lamb should reach an internal temperature of 145F (medium-rare) to 160F (medium). Lower fat alternative: If you’re avoiding animal fats, trim the meat very closely removing all visible fat (or ask the butcher to do it). Preheat the oven to 450F (230C). Prepare as above for roasting. Roast at the high heat for 15 minutes to seal the meat, then lower heat to 350F (175C) and cook as above. 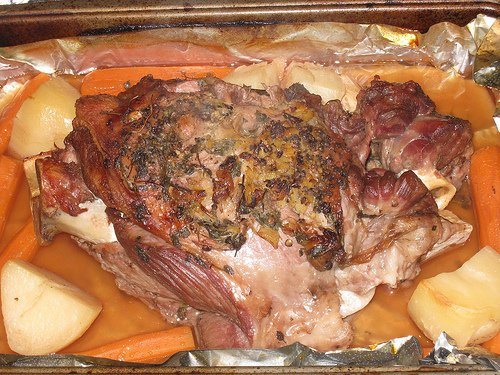 Alternate preparation: For 4-6 poeple, make this dish with 8 pounds of leg of lamb (bone in), trimmed of outer fat. When making the cuts for the garlic, make them narrow and down to the bone. Cook 20-25 minutes per pound for medium-rare, 25-30 minutes for medium.